Xone:PX5 incorporates a high specification 20 Channel 96kHz, 24bit USB Soundcard, allowing it to be seamlessly integrated into digital DJ workflows. Additionally the Xone:PX5 Soundcard supports DVS control of Native Instruments’ TRAKTOR SCRATCH PRO 2 DJ software. Plug your PC/Mac into the Xone:PX5 and use the TRAKTOR SCRATCH PRO 2 control media (control vinyl or CDs) to intuitively control and scratch with digital audio files stored on your computer. The original and best. The Xone filter is a legend in the DJ booth – none of its imitators come close. Xone:PX5’s filter includes HPF, BPF, LPF, resonance control and frequency sweep, plus the option to route the Aux channel and External Return to the filter. Xone:PX5 features an integrated MIDI clock engine which can send start/stop messages to external equipment. The 5-pin MIDI Sync/Out connection integrates external software/hardware instruments such as drum machines and synthesizers which can be connected via ¼” jack input connections (mono/stereo). Xone:PX5 can also send/receive MIDI clock information through the USB connection. 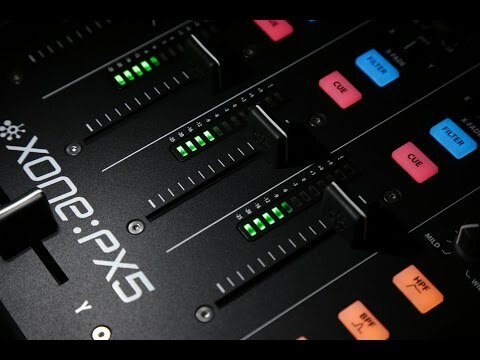 On top of its four fully featured phono/USB/line channels, Xone:PX5 has a flexible mic / aux channel with XLR and ¼” jack connectors and full 3 band EQ. If you don’t perform with mics, the additional inputs allow this channel to be used as an extra stereo music source or USB Return channel. Upgrade to an Innofader Pro 2 crossfader (available separately) for ultimate performance. Always a popular choice for scratch DJs.